Whether you are cycling in the city or the countryside, the effect that the last decades cycling trend has had on our environment deserves consideration. Back in the 1990’s I moved to London Fields, a would-be trendy area in London’s East End, with dreams of my humble new neighbourhood, full of beautiful Victorian homes, becoming gentrified. Some 20 years or so later, it is a great place to live. Within spitting distance of the City, it’s the perfect place to live and cycle to work. The transport infrastructure, which has undergone little updating over the last 75 years, lends itself beautifully to cycling and its prevalence of new inhabitants with the vision and foresight to appreciate the great architecture and spaces of the Victorian era, are the uber cool media types of the new millennia. Sadly for me, I moved to London Fields too early. A small child and a hectic career, made the constant worry of living in an inner city urban area too great and I succumbed to country living. Looking back now, I wish I had stuck it out and had some latter day experience of cycling in London. The noise, the buzz, the crazy dicing with cars and the elements would add a different level of thrill to cycling here on the Devon roads. Of course, cycling in Devon, with its jaw dropping scenery, manic weather and challenging terrain has its own excitement! But looking back at London Fields, I remember how much I love change, even if it is a long time coming. And change is definitely something that has followed this new breed of cyclists. The article in question makes the point that, as new areas come alive, this often heralds new roads and transport links. Commuter cyclists in the newly gentrified London Fields and surrounding areas show how making the most of current infrastructure allows neighbourhoods to regain their identity and opt for more sustainable modes of transportation. Cycling is better for the City, better for the air we breath and much better for us as individuals. Beautiful Solid Oak Bike Rack. Plain or Personalised. 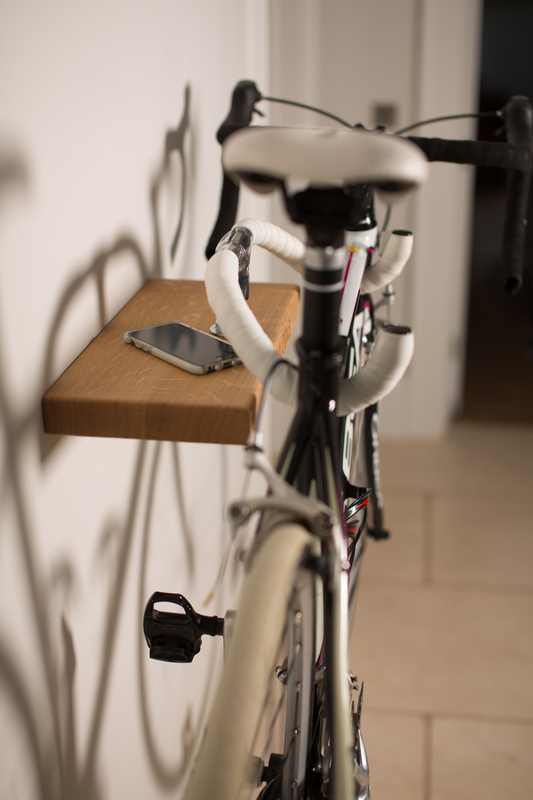 Also available in walnut with handlebar wrap options.